The total mass discharged by the phreatic eruption of Ontake Volcano, central Japan, on September 27, 2014, was estimated using several methods. The estimated discharged mass was 1.2 × 106 t (segment integration method), 8.9 × 105 t (Pyle’s exponential method), and varied from 8.6 × 103 to 2.5 × 106 t (Hayakawa’s single isopach method). The segment integration and Pyle’s exponential methods gave similar values. The single isopach method, however, gave a wide range of results depending on which contour was used. Therefore, the total discharged mass of the 2014 eruption is estimated at between 8.9 × 105 and 1.2 × 106 t. More than 90 % of the total mass accumulated within the proximal area. This shows how important it is to include a proximal area field survey for the total mass estimation of phreatic eruptions. A detailed isopleth mass distribution map was prepared covering as far as 85 km from the source. The main ash-fall dispersal was ENE in the proximal and medial areas and E in the distal area. The secondary distribution lobes also extended to the S and NW proximally, reflecting the effects of elutriation ash and surge deposits from pyroclastic density currents during the phreatic eruption. The total discharged mass of the 1979 phreatic eruption was also calculated for comparison. The resulting volume of 1.9 × 106 t (using the segment integration method) indicates that it was about 1.6–2.1 times larger than the 2014 eruption. The estimated average discharged mass flux rate of the 2014 eruption was 1.7 × 108 kg/h and for the 1979 eruption was 1.0 × 108 kg/h. One of the possible reasons for the higher flux rate of the 2014 eruption is the occurrence of pyroclastic density currents at the summit area. A phreatic eruption on the south flank of Kengamine, south of the summit area of Ontake Volcano, central Japan, occurred at 11:52 on September 27, 2014. The eruption occurred at the upstream end of the Jigokudani Valley (Nakano et al. 2014). The eruption plume rose as high as 10.8 km a.s.l. (Sato et al. 2015). The eruption started at 11:52 and ended by 18:00 on September 27. More than eight craters and three pyroclastic cones were formed in the area (Nakano et al. 2014), and the ash-fall deposit was found as far as 85 km east of the source. Clumps of fine ash, commonly seen in the proximal and medial areas, were found as far as 16 km from the source (Fig. 1), perhaps due to the coalescing effect of vapor in the phreatic eruption column. Dilute pyroclastic density currents (surges) were observed at the southern part of the summit area and descended in a SSW direction as far as 2 km from the source (Yamamoto 2014). Pyroclastic density currents were also observed moving toward the NW (Nakano et al. 2014). The ash-fall deposit was distributed toward the ENE and NE. Unfortunately, 63 people are dead or missing because of this eruption, which was the worst volcanic disaster in Japan since World War II. Most were killed by ballistic impacts from the phreatic eruption within 1 km of the vent (Kaneko et al. 2016). 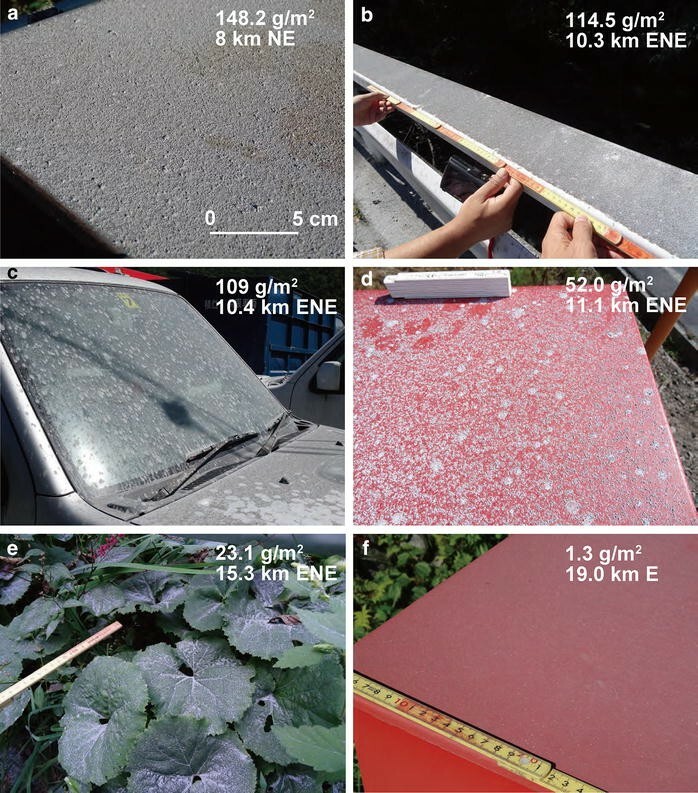 The Joint Research Team for ash fall from the 2014 Ontake eruption conducted a field survey that included ash-fall sampling and documenting ash distribution immediately after the eruption. Estimating the total discharged mass during its early stages is important in establishing the volcanic conditions and for forecasting possible subsequent volcanic activity. Preliminary results of the ash-fall distribution study and total discharged mass calculations were reported at the 130th Meeting of Japanese Coordinating Committee for the Prediction of Volcanic Eruptions (AIST 2014; The Joint Research Team for ash fall in Ontake 2014 eruption 2015). Over the last several decades, there has been much debate about how best to use the ash-fall isopleth and isopach distribution maps. Walker (1980, 1981) proposed a crystal concentration method. Hayakawa (1985) proposed a method that required only a single isopach (V = 12.2TA; T: thickness, A: selected isopach area). The constant of 12.2 was obtained from plinian tephra fall volumes using the crystal concentration method. Pyle (1999), however, proposed that this value was variable rather than constant. Pyle (1989, 1995) and Fierstein and Nathenson (1992) proposed an exponential decay method with [T = T 0exp(−kA 1/2); T: thickness, T 0: extrapolated maximum thickness, A: isopach area, k: slope on a lnT–A plot]. Takarada et al. (2001) proposed a segment integration method. Bonadonna et al. (1998) and Bonadonna and Houghton (2005) proposed a power law method. Bonadonna and Costa (2012) proposed a Weibull method, Tajima et al. (2013) proposed an ellipse-approximated isopach method, and Green et al. (2016) proposed a Bayesian statistical method to estimate tephra volumes from a limited number of sparsely distributed observation points. The main reasons that so many methods have been proposed are as follows: The fact that many studies have a limited number of sampling data, different fitting curves have been used for various styles of eruptions, and there are inaccuracies involved in the extrapolation of fitted curves to the proximal and distal regions. In this study, we use the segment integration, exponential, and single isopach methods to estimate the total discharge mass of the September 27, 2014, Ontake phreatic eruption. We also estimate the total discharge mass of the 1979 Ontake volcano phreatic eruption, in order to compare the two eruptions using the segment integration method. The Geological Survey of Japan conducted a 3-day field survey of the ash-fall deposit as a part of the Joint Research Team for ash fall in Ontake 2014 eruption, from September 28 to 30, 2014 (AIST 2014; The Joint Research Team for ash fall in Ontake 2014 eruption 2015). The Ontake Volcano Proximal Area Survey Joint Research Team also conducted a field survey at the summit proximal area on November 8, 2014. The ash-fall deposits were collected from relatively flat surfaces (e.g., the top of a fire hose box; Fig. 1a, d, f), and the area of the collected samples was measured. The samples were dried and weighed, and weight/m2 (g/m2) was calculated for each sampling point. An isopleth mass distribution map was drawn, based on the weight/m2 values at the sampling points (Fig. 2). Isopleth mass contours at 1, 2, 4, 8, 16, 32, 64, 128, 256, 512, 1024, 15,000, 75,000, 150,000, 450,000, 750,000, and 1,500,000 g/m2 were drawn. An average density of 1500 kg/m3 for the ash-fall deposit was used to convert the thickness data to weight/m2 in the proximal region. This value was based on our measured densities of ash-fall deposit 2 km ENE from the source (1540 and 1420 kg/m3). Aerial photographs and helicopter flight observations were the principal means used to draw isopleth mass contours where no sampling points existed, mainly based on observations of the lobate shape of ash-fall and pyroclastic density current deposits. The 1024 g/m2 contour boundary was relatively clearly seen as a white and gray margin of ash deposit from the aerial observation. The other contours at points where there was no sampling are inferred from faint ash-fall distributions. Two lobes toward the NW and SSW, which were seen from the aerial observations (Nakano et al. 2014), were probably mainly due to the effects of ash elutriation and surge deposits from pyroclastic density currents. Three pyroclastic cones were formed at the vents as high as a few to 10 m on September 27, 2014 (Nakano et al. 2014; Kaneko et al. 2016). We did not include these pyroclastic cones for the estimation of the ash-fall mass discharge. We assumed about 100 cm (1.5 × 106 g/m2) to be the maximum average thickness at the source area, based on comparison with the height of the pyroclastic cones (Fig. 2b). The area of each isopleth mass contour was calculated using GIS software (ArcGIS). The weight (kg/m2) and area (m2) of each contour value are plotted on a diagram (Fig. 3). The point data were not aligned on a single line, but could be subdivided into 8 segmented lines (Fig. 3). We calculated the mass for areas up to 1012 m2 at the distal limit. The equations for each regression line were used to calculate the mass of each segment using the segment integration method (Takarada et al. 2001, 2002). The field survey results were, for example, 148.2 g/m2 at 8 km NE from the source (Fig. 1a), 114.5 g/m2 at 10.3 km ENE (Fig. 1b), 109 g/m2 at 10.4 km ENE, 52.0 g/m2 at 11.1 km ENE (Fig. 1d), 23.1 g/m2 at 15.3 km ENE (Fig. 1e), and 1.3 g/m2 at 19.0 km E (Fig. 1f). The dispersal axis for the ash-fall deposit is ENE in the proximal and medial areas and toward the E in distal areas (Fig. 2). The total discharged mass of the September 27, 2014, phreatic eruption was calculated to be 1.18 × 106 t (1.18 × 109 kg; Fig. 3). The proximal deposit, within the 1-cm (1.5 × 104 g/m2) isopach, consists of 95 % of the total discharged mass (1.12 × 106 t). However, the mass of the ash in the distal region (<4 g/m2) was only 0.9 % (1.0 × 104 t) of the total discharged mass. The exponential method, which uses the equation T(x) = ce−mx (where T is a function of root isopach area, c is the theoretical maximum thickness at the vent, and m is the rate of decrease in tephra thickness; Pyle 1989; Fierstein and Nathenson 1992), was adapted to compare estimation results using mass (Fig. 4). The AshCalc Python tool (Daggitt et al. 2014) was used to draw five multi-segmented regression lines. The calculated total discharged mass was 8.9 × 105 t, which is slightly less but relatively similar to that calculated using the segment integration method (1.18 × 106 t). According to the exponential method, more than 98 % of the total discharged mass accumulated within the proximal region (>512 g/m2; 8.75 × 105 t). The single isopach method (V = 12.2TA; T: thickness, A: selected isopach area; Hayakawa 1985) is sometimes used to estimate the volume of ash-fall deposit (and widely used in Japan), because the total discharged volume can be calculated based only on one isopach. We adapted this method to estimate the total discharged mass using each of 17 isopleth contour lines (Table 1; Fig. 5). The average density of 1500 kg/m3 was used to convert thickness data to weight/m2. The results show large variations, from 8600 t (calculated using the 2 g/m2 contour) to 2.5 × 106 t (calculated using the 450,000 g/m2 contour). A trend gap between the 1024 and 15,000 g/m2 contour results may be due to the occurrence of pyroclastic density currents at the summit area (Fig. 5). The regression line of the 2014 ash-fall deposit on the log weight–log area plot is not a straight line, but can be subdivided into eight segments as shown in Fig. 3, indicating that TA is not constant. These results suggest that the single isopach method is not applicable to small-scale phreatic eruptions. The isopleth mass distribution maps of the 2014 and the 1979 Ontake eruptions are shown in Fig. 6. The isopleth mass map of the October 28, 1979, phreatic eruption shows an ENE–NE distribution (red contours; Kobayashi 1980). The overall total discharged mass from the 1979 phreatic eruption was calculated using the segment integration method (Takarada et al. 2001), resulting in a total value of 1.86 × 106 t (Fig. 7). The regression line was almost straight on the log weight–log area plot and subdivided into two segments (750,000–1,500,000 and <750,000 g/m2). We calculated up to 1012 m2 area at the distal limit. An average density of 1500 kg/m3 was used to convert deposit thickness into weight/m2. The result shows that the total discharged mass from the 1979 eruption was about 1.6–2.1 times larger than that from the 2014 eruption. The 1979 ash-fall deposit is more widely distributed in the medial region than that of the 2014 eruption, and the 2014 ash-fall deposit is relatively thinner in the medial region compared to the 1979 deposit. For example, the 1500 g/m2 (1 mm) contour of the 1979 eruption is wider than the 1024 g/m2 (0.7 mm) contour of the 2014 eruption. Comparison of the ash-fall distribution between the 2014 and 1979 deposits in the proximal area, however, shows that a relatively larger amount of ash accumulated proximally during the 2014 eruption than during the 1979 eruption, even though the total volume of ash was less. We suggest that the thicker proximal ash in 2014 was mainly due to additional deposition from the pyroclastic density currents in the proximal area. Takarada et al. (2014) previously calculated the total discharged mass for the September 27, 2014, eruption as between 6.2 × 105 and 9.9 × 105 t, but no proximal field survey data were available at that time. The estimations including proximal field data are 8.9 × 105 t (exponential method; Fig. 4) and 1.2 × 106 t (segment integration method; Fig. 3). Therefore, detailed proximal area data are relatively important for obtaining a more accurate estimation of the total discharged mass of phreatic eruptions. More than 90 % of the total mass (1.1 × 106 t) of ash-fall accumulated in 2014 was within the proximal area (>1 cm in thickness; Fig. 3), showing that, for small eruptions, field measurements in the proximal area are necessary in order to make reliable estimates of discharged mass. By contrast, the mass of fallout in the distal region (<4 g/m2) was only 0.9 % (1.0 × 104 t) of the total discharged mass. Therefore, detailed field surveying of ash-fall distributions in the distal region is less important than in the proximal and medial area for the estimation of the total discharged mass of a small-scale phreatic eruption. Sparse sampling points are sufficient. Even when well-constrained (i.e., with many sampling points) contour lines were used (such as 32 and 64 g/m2) using the single isopach method, the resulting volumes were much smaller (2.2 × 104 and 3.4 × 104 t; Table 1) than the results obtained using the segment integration and exponential methods (8.9 × 105 and 1.2 × 106 t). The equation V = 12.2TA was originally obtained empirically from relatively large-scale volcanic eruptions (>2 km3). Therefore, Hayakawa’s single isopach method is not suitable for small-scale eruptions. We would like to suggest that error values should be shown when the single isopach method is used for middle and large-scale eruptions. The 2014 eruption began at 11:52 and ended by 18:00 on September 27 (Sato et al. 2015). The duration of the phreatic eruption was about 6 h, and the total discharged mass was about 1.0 × 106 t (average of 8.9 × 105 and 1.2 × 106 t). Therefore, the average discharged mass flux rate of the 2014 eruption is about 1.7 × 108 kg/h (4.2 × 104 kg/s). The 1979 eruption began at 5:20 and ended by midnight on October 28, 1979 (Kobayashi 1980). The duration of the 1979 eruption was about 18–20 h, and the total discharged mass was 1.9 × 106 m3. Therefore, the average discharged mass flux rate of the 1979 eruption was about 1.0 × 108 kg/h (2.5 × 104 kg/s). The average discharged mass flux rate of the 2014 Ontake eruption was about 1.7 times higher than the 1979 eruption. One of the possible reasons for the higher mass flux rate of the 2014 eruption than the 1979 eruption is the deposition of elutriation ash and surge deposits from pyroclastic density currents in the summit region. The greater discharged mass (1.9 × 106 t) and lower flux rate (1.0 × 108 kg/h) of the 1979 eruption compared to the 2014 eruption can be explained by the 3–3.3 times longer duration of the eruption (18–20 h against 6 h). The detailed isopleth mass distribution map for the September 27, 2014, phreatic eruption of Ontake Volcano extends as far as 85 km E of the source (Fig. 2) and was made based on the field survey of the Joint Research Team for ash fall in Ontake 2014 eruption. The main dispersal axis was toward the ENE in the proximal and medial region and toward the E in the distal region. Total discharged mass of the 2014 phreatic eruption of Ontake Volcano is estimated at 1.2 × 106 t using the segment integration method and 8.9 × 105 t using Pyle’s exponential method. The large variations in discharged mass calculated using Hayakawa’s single isopach method show clearly that this method is not suitable for the estimation of small-scale eruption volumes. The October 28, 1979, ash-fall deposit in the medial region covers a wider area than the 2014 deposit. The 2014 deposit in the proximal region, however, covers a wider area than the 1979 deposit, mainly due to the additional deposition of elutriation ash and surge deposits from pyroclastic density currents. The total discharged mass of the 1979 phreatic eruption was estimated at 1.9 × 106 t, 1.6–2.1 times larger than that in 2014. The estimated average discharged mass flux rate for the 2014 eruption was 1.7 × 108 kg/h and for the 1979 eruption was 1.0 × 108 kg/h. One possible reason for the higher flux rate of the 2014 eruption is the occurrence of pyroclastic density currents in the summit area. All authors contributed to field surveying and ash sampling, data processing, and drawing the distribution map. TO made the distribution maps of the proximal area. ST calculated the total discharged mass using the segment integration, exponential, and single isopach methods. All authors read and approved the final manuscript. We are indebted to the members of the Joint Research Team for ash fall in Ontake 2014 eruption: Setsuya Nakada (ERI), Fukashi Maeno (ERI), Mitsuhiro Yoshimoto (MFRI), Wataru Hirose (GSH), Akihiko Terada (Tokyo Institute of Technology), Yusuke Suzuki (Izu Peninsula Geopark), Yasuyuki Miyake (Shinshu University), Yasushi Takahashi (Shinshu University), Yoshihiro Takeshita (Shinshu University), Takahiro Miwa (NIED), Masashi Nagai (NIED), Masaaki Tsutsui (Dia Consultant), and Yasuhisa Tajima (Nihon Koei); and also members of the Ontake Volcano Proximal Area Survey Joint Research Team: Jiro Komori (Teikyo Heisei University), Yoshimoto M, Takeshita Y, Maeno F, Nakada S, and Taketo Shimano (Tokoha University) for valuable data sampling and analysis. Comments from J Fierstein and an anonymous reviewer were quite helpful to improve the manuscript. We appreciate all the support from members of the Research Institute of Earthquake and Volcano Geology, Geological Survey of Japan, AIST.